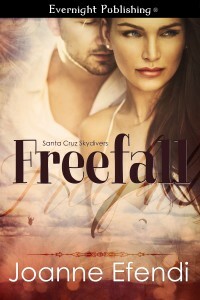 Twenty-five year old Professional skydiver Levi James has a troubled past that he just can’t seem to leave behind. The main cause of his problems – his father, a billionaire Australian publishing magnate, who after being MIA for most of Levi’s life, has decided Levi needs to start playing a role in the family business, whether Levi wants to or not. Andi LaRosa, a twenty-one year old Costco cashier, comes from a loving, if somewhat suffocating, traditional Italian American family. With no direction and in a deep depression, she often seeks solace in Valium and the bottom of a Vodka bottle. That is until see meets Levi and instantly falls for his Aussie charm. The daredevil skydiver makes her feel alive and gives her a sense of direction that she so desperately craves. But can their fledging relationship survive Andi’s personal demons and Levi’s meddling father, who refuses to his son go? I lay in his bed, listening obsessively to everything he did, kicking myself at my cowardice. At this moment, I could be with him, but here I was…alone. Something was wrong with me. I wanted it, I wanted him, but was too afraid to reach out. Years of rejection had taken their toll. Behind the closed bathroom door, the toilet flushed and the faucet turned on as I heard him go about a normal waking routine. Next, I was waiting for the sound of the shower. Instead, he reappeared in the bathroom doorway, still naked and still glorious.